Marjorie Day was her name. The name of the woman brutally strangled and then strung up on a bell rope in the bell tower of St Margaret’s Church, to look as if she had committed suicide – and just as all were gathered for a PCC meeting! 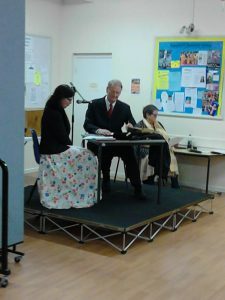 This was the scenario which met us at our ‘Murder at St Margaret’s’ mystery evening recently. Perfectly respectable members of our congregation took on new personnas like: The Revd Augustus Boreham (Boreham by name and boreham by his sermons! 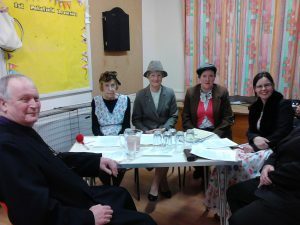 ); Miss Freda Banks, the treasurer; Mrs Pearl Pledge, the cleaner; Miss Irish Bunch, flower arranger, Gladys Dinger, lead bell ringer; and Albert Diggory the undertaker. What did they all have in common? 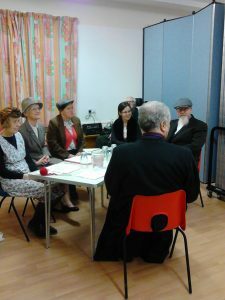 Yes, you’ve guessed it they all disliked Marjorie who was a nosy, busy body and had information on each of them that they did not want to be revealed.So in came Inspector George Truncheon to investigate the situation. In between a delicious 2-course meal served by our hardworking, wonderful kitchen crew, we were given clues – (and red herrings) to try and guess the murderer.Then when everyone had been interviewed, we were served our teas and coffees and then the debating and investigating took place at each table – plus the calling and delivering of our raffle with great prizes! Finally, Inspector Truncheon revealed the murderer – the Parish Treasurer, Miss Freda Banks, who had been ‘cooking the books’ and in a fit of angst had hit Miss Day, found herself pulling tight the scarf around her neck, and then dragged her into the bell tower and pulled her up onto one of the bell ropes. 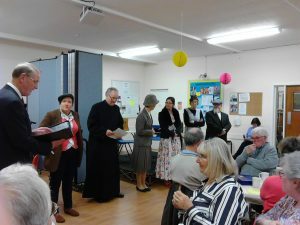 Trudie, our Lay Reader, had put together a wonderful script to including lots of local references and chosen a great team of actors to take part, including our Rector Sharon, who playing the Treasurer, was arrested as the murderer! 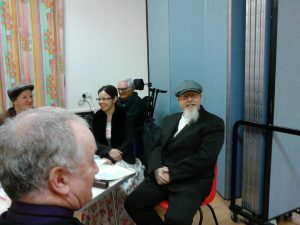 A great evening was had by all, and at the end of it, £424.00 was raised for Church Funds! This entry was posted in Uncategorized on March 25, 2019 by Sandra Bendall.